Bell peppers and basic seasonings flavor this tasty Mexican-style corn blend. Use fresh or frozen corn kernels in this recipe. This corn is an excellent side dish to serve with pork, ham, or a Tex-Mex style dish, and there are many possible flavor variations. If you have lots of fresh-from-the-garden corn, scale the recipe up and freeze it in meal-sized portions. In a skillet or saute pan over medium-low heat, melt the butter. When the butter is hot add the corn, salt, and pepper, and green bell pepper. Cook, stirring occasionally, for about 20 minutes. Add the chopped pimiento and heat through. Garnish the corn with chopped fresh cilantro, if desired. If you have an abundance of fresh corn, scale the recipe up and freeze it in freezer bags or containers. Label with the name and date and freeze for 10 to 12 months. Add 2 to 3 tablespoons of finely chopped red, yellow, or sweet onion to the skillet along with the bell pepper. Add 2 tablespoons of finely chopped sweet red bell pepper to the skillet along with the green bell pepper. Omit the pimiento. Add 1/2 to 1 teaspoon of chili powder to the corn for Tex-Mex flavor. 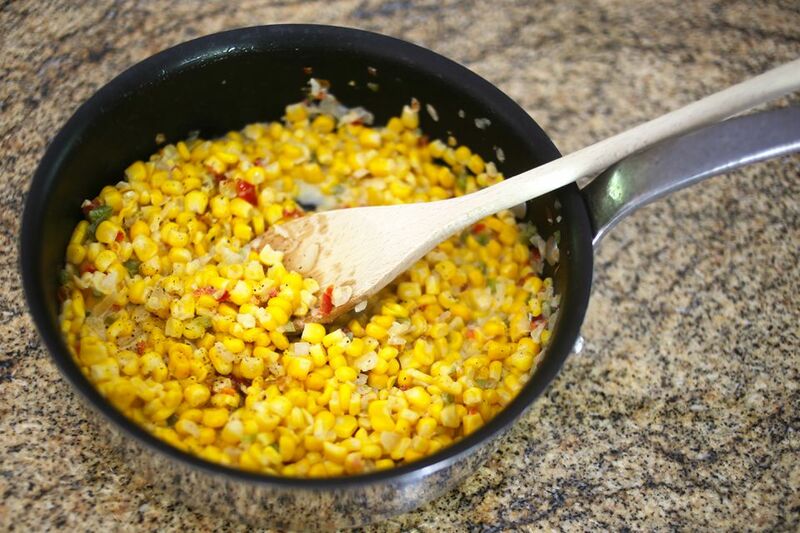 Add some heat to the corn with a tablespoon or two of finely minced jalapeno pepper.